Justification for the current wave of ethylene investments in the US relies on sufficient cost advantage (primarily feedstock driven) to generate acceptable investment returns despite exporting most of the production. Historically there are few examples (outside of the Middle East) of ethylene investments generating an IRR approaching expectations when the original decision to invest was made. Where there have been positive surprises, luck has been a larger driver with one of the short periods of peak ethylene margins occurring in time to generate the better IRR. We remain bullish on the ethylene cycle, expecting robust margins from 2019 but can see a scenario where US investments fail to meet expectations, even with the shale gas advantage. Oil prices have fallen from their highs of 2013/2014 and investments to increase exports of LNG, ethane, and propane are creating upward pressure on ethane and propane relative to oil – cost advantage alone will likely not be enough to generate adequate returns. Most ethylene investment decisions of the last four years likely modeled an ethylene margin above 20 cents per pound, with a downside of perhaps 15 cents, relying on the shale gap. The current smaller oil/ethane gap, coupled with the need to discount US ethylene to encourage increased exports has pushed margins down close to 15 cents today. Our detailed cost-curve analysis suggests margins as low as 12 cents per pound in an oversupplied world. New builds do not work at this level of margin – even those on time and on budget. Nova’s Williams deal (which we like) does better than on time/budget building with margins above 15 cents, not below, because the scale efficiencies of the new builds offset the earlier cash flows of the buy (vs build) decision. Exhibit 1: A margin for new build 12.5% IRR, B adds 20% contingency, C add export cost. Note – This research supports the buy versus build thesis very well and the idea that further consolidation is inevitable. It would support our LYB buys WLK idea, but should be supportive of other buyout targets such as HUN and TSE, as well as other moves post the Dow/DuPont merger. Recent US ethylene margins sit well below the levels needed to justify reinvestment – Exhibit 1. They reflect how low ethylene prices need to go to find an incremental buyer in the US with enough economic incentive to export – either ethylene or derivatives. As the capacity base expands in the US this dynamic will continue to dictate the value of the marginal pound of new or increased production. You have a guaranteed (in writing) feedstock edge (the President of SABIC was my co-presenter that morning!). Or – you get lucky on timing with a cycle. Interestingly there are very few examples of that. Since 2014 we have seen many debottlenecks of ethylene facilities in the US – ethane based ethylene capacity in the US has increased by almost 4 million tons from 2010 through the end of 2016. These have generally been low cost and relatively quick moves and we would estimate that they have cost 30-50% of what a new build would cost, and have taken 50% of the time. This is where the money has been made – Exhibit 2. In Exhibit 2 we also show how a new build would look based on the models outlined later in the report and we show an estimate of what the Nova economics might look like with its purchase of the Williams assets. 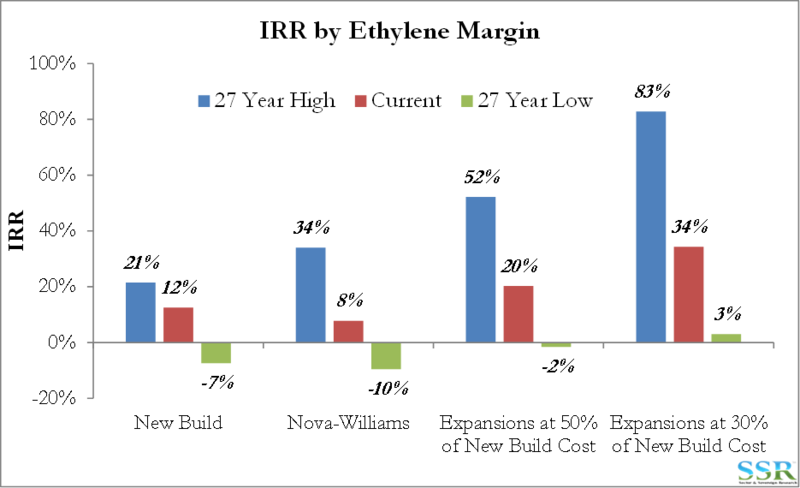 We are assuming that Nova paid essentially replacement cost for the asset, and what is interesting from the data in Exhibit 2 is that if we assume current ethylene margins, Nova’s benefit of immediate cash flows is offset by the scale efficiencies of a new-build giving almost the same IRR. In the low case Nova looks worse because it has immediate negative operating cash flows rather than negative operating cash flows starting three years from now. The upper and lower ranges represent the highs and lows of US ethylene margins – on a 2017 inflated basis – since 1990. The clear winners were the early low cost debottlenecks – the ones able to catch some of the 2013/2014 margins. Note that while we are using the margin data from Exhibit 6, the “LOW” case is a 1.05 standard deviation event from average, while the HIGH case is a 2.6 standard deviation event. Based on a data set from 1990. Our current interest in ethylene has been because of supply/demand, and a view that the global market is unlikely to be as oversupplied as is discounted in current stock pricing in 2018, with operating rates and margins improving in 2019 and beyond because of lack of sufficient investment. We have not been a big advocate of the US shale advantage except for its short-term cash flow benefits, mostly because we have yet (over 35 years) to see a 5-year forecast of relative oil and natural gas pricing play out as expected – the volatility in the margin chart in Exhibit 1 shows that our skepticism is justified. The extremely steep cost curve of the 2013-2014 period was first flattened by crude oil falling and then coal prices falling – impacting China specifically. Increased US LNG exports – helping to support US natural gas pricing. Increased US ethane exports – improving ethane prices relative to natural gas. Increased demand for ethane every day from expansions and now new-builds – Oxy already running and Dow suggesting that its unit is mechanically complete already. Increased propane exports – but likely limited without increases in receiving infrastructure. Note: One easy way for the Trump administration to address trade imbalances is to encourage US exports of LNG, LPG and ethane. If Japan and South Korea (for example), and possibly Europe and China, can be persuaded to favor US LNG, LPG etc. over supplies from the Middle East – this may reduce pressure on the “fair trade” calls with respect to several current trading partners. This is unlikely to be a positive for the US “shale advantage” for chemicals, although the exports of chemicals and plastics themselves – however (un)profitable for US producers – would also help the trade balance. The cost of ethane in the US relative to crude is rising off its lows – Exhibit 3, and while it may look insignificant in a longer-term chart, if we just show the recent history – as well as our possible forward scenario (red star) – the possible changing landscape is very clear. Crude oil at $50 per barrel and US natural gas at $4.00 is a very possible longer-term scenario. 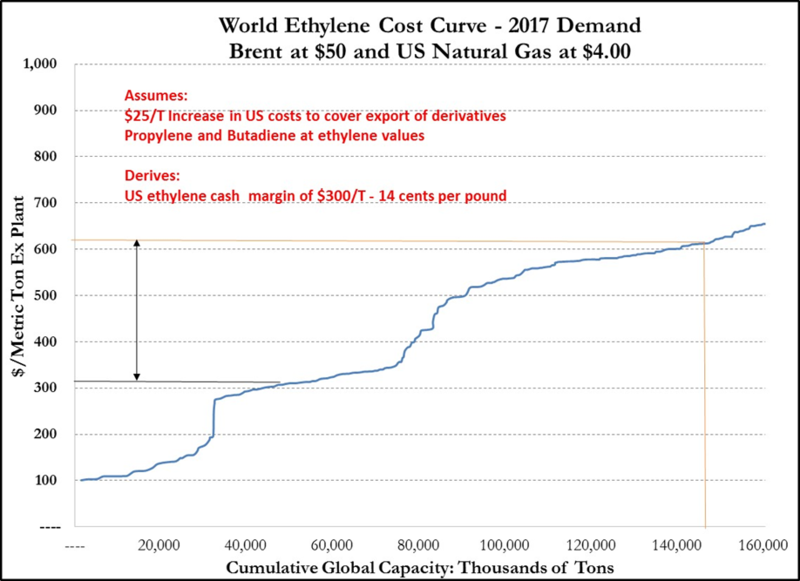 If you then assume that ethane continues to trade at a premium to its extraction value as more is pulled into US ethylene and export, the global cost curve has the shape shown in Exhibit 5, and generates a “theoretical” ethylene margin for the US of 14 cents per pound. We assume that ethylene costs in the US must increase to reflect the cost of increasing export volumes – in the Exhibit we have raised average US costs by $25 per metric ton – so just over 1 cent per pound. 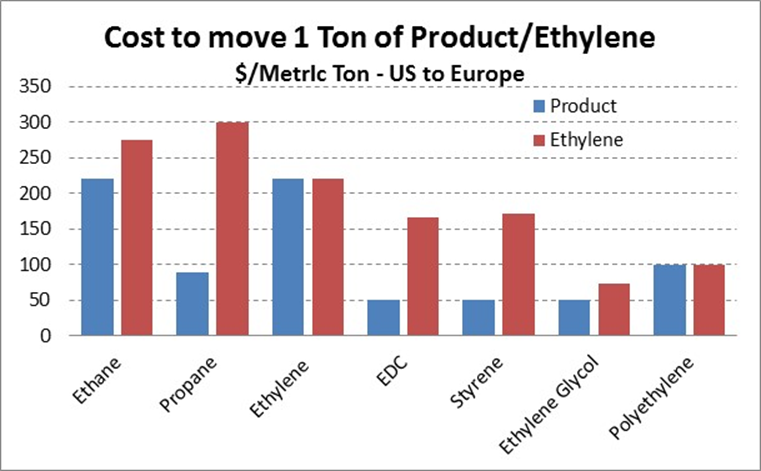 The physical exports will cost more, but they are only a proportion of US ethylene sales. The analysis in Exhibit 5 is very sensitive to certain assumptions – if propylene and butadiene trade at a 15% premium to ethylene the cost curve flattens and the US break-even margin falls below 12 cents per pound and if propylene and butadiene trade at a discount, the US ethane advantage is increased. Similarly – if crude rises relative to natural gas the US benefit increases. Naphtha (and all feedstocks other than ethane) require significantly larger volume of feed to produce a ton or pound of ethylene, but produce large quantities of co-products such as propylene, butadiene, aromatics and others. The margin/profitability calculation for these units involves crediting the valued of the co-products, hence the higher the price of propylene (or any other co-product), the lower the cost of making ethylene and vice versa. According to LYB’s presentation last week the margin from naphtha based ethylene in Q1 in the US was similar to ethane – despite the oil/natural gas spread – higher co-product pricing contributed. In the analysis that follows we are using two scenarios. 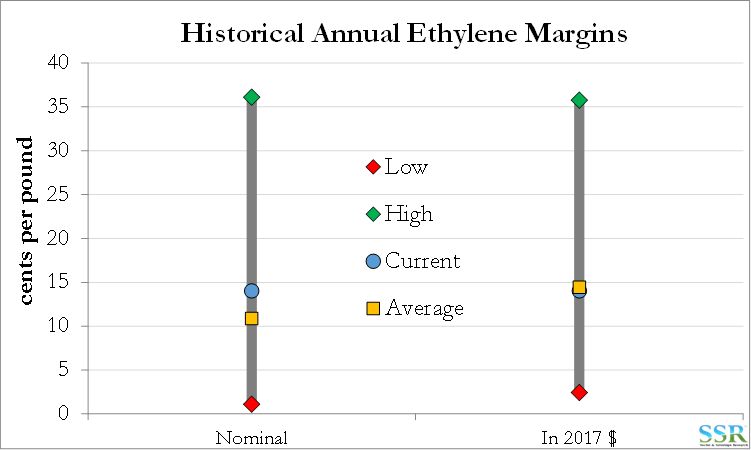 The low case margin derived from the chart in Exhibit 5 and as a high case we are using a 5-year historic average US ethylene margin (which is around 26 cents per pound). Together these show very different fortunes for possible US investments. In the low scenario, both recently announced new-builds in the US – Exxon/SABIC and Total/Borealis/Nova should get delayed or cancelled. With the “air cover” of the US natural gas advantage shrinking, and the need for US ethylene to be priced at a level which provides incentives to export, we look at the possible investment returns on the current and expected new-builds and conclude that there may not be as much money in these investments as people think. This will be especially true if we do not see the ethylene shortage that we expect globally beginning with increasing operating rates in 2019/20. There is a new wave of ethylene capacity coming out of the woodwork for the 2021-2023 timeframe – Exxon/SABIC, Total/Borealis/Nova, Shell and likely Dow. At the same time IHS is predicting another wave in China – some based on imported methanol and some based on coastal refinery integration. In a worst case, on that basis, we may only have a short window of better margins – 2019-2021. 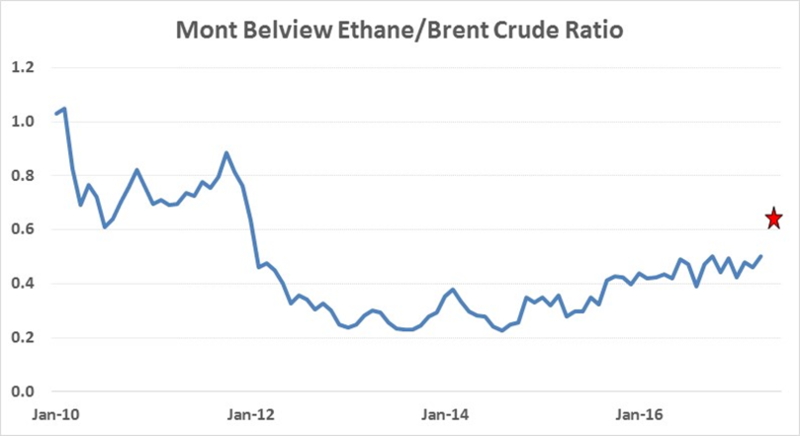 The bull case is summarized in Exhibit 6 – it shows the IRR of a new ethane based ethylene plant in the US, if forward margins reflect the five-year recent average. We have showed the economics over time – with historic margins expressed in constant 2017 dollars using a plastics manufacturing PPI (see appendix), and the IRR in each year reflecting construction beginning in that year. For example, for 1990 – the IRR reflects a three year build – starting Q1 1990 and ending 3 years later with revenues and margins beginning in 1993. In each case, we are using the same capital cost and plant scale to show how a current investment would have looked if it had been made in that year and seen the actual forward margins. Shutdowns every 5 years – capex in shutdown year is 4% of total build cost and in other years it is 2%. We have shown sensitivities for cost over-runs as well as lower capex and we have shown a sensitivity for a 1 year delay in construction – i.e. no revenue until year 5. We have used a 7% discount rate. Terminal value is 8x last year EBITDA. The 2016 return is the forward return for a new project based on the 5-year margin average. This chart looks good for a prospective builder if you ignore the period from 1990 to 2000 and assume that the last 5 years are predictive of the future. Note that most of the new build decisions in the US were made in the 2012-2015 period. 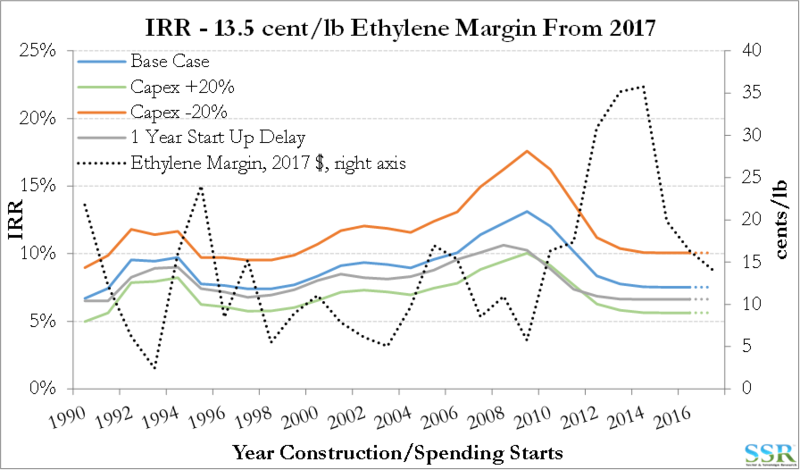 Most will have had a base case ethylene margin of more than 20 cents per pound in the model – generating an IRR in the 12-15% range – 400-500 basis points lower if you overspent or took longer to build. However – as shown in Exhibit 7 the chart looks very different if you plug in the break-even margin from Exhibit 4 as a long-term forecast – this is the likely bear case, although margins have averaged below 14 cents over the long-term. Worst case here is that you get the 14 cent margin and you are a year late and overspend – then your IRR falls below 6%. In each chart, we are looking at the 2015 data point to represent the forward case at the fixed margin. The history in this chart is also very different than the one above – if we assume the lower forward margin, only start-ups in the 2007-2011 period would have had an IRR greater than 10%, and only then if you started up on time and close to budget. During the period from 2007 to 2011, US ethane or flexible ethane based ethylene capacity fell by around 1 million tons! So, no-one got it right! 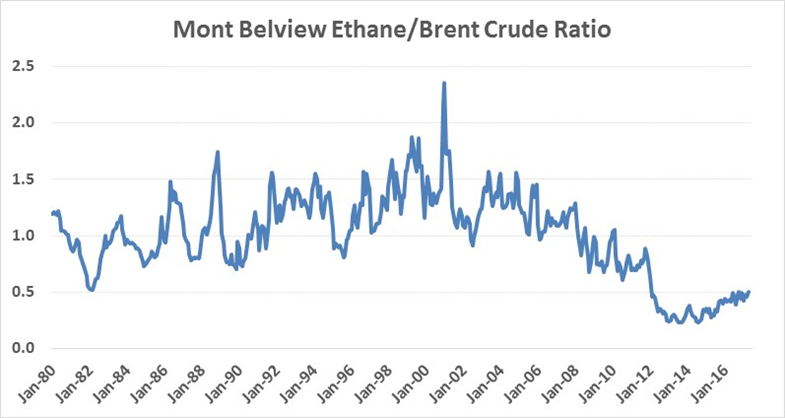 In the 35 years that we have been covering the ethylene space in one form or another we have not found an investment that has generated an adequate IRR or positive DCF by timing a cycle or by betting on moves in energy. The only success stories have been where feedstock has either been truly stranded (such as the Middle East in the early days) or subsidized to guarantee a fixed margin. There are a handful of examples of additions that simply got lucky but they are hard to find. Note that, while we may be in a new world with respect to US natural gas cost advantage, the 14 cent margins we are using as a bear case is above the long-term average (which includes the recent peak) and is not far below the Q1 2017 margin – Exhibit 8. 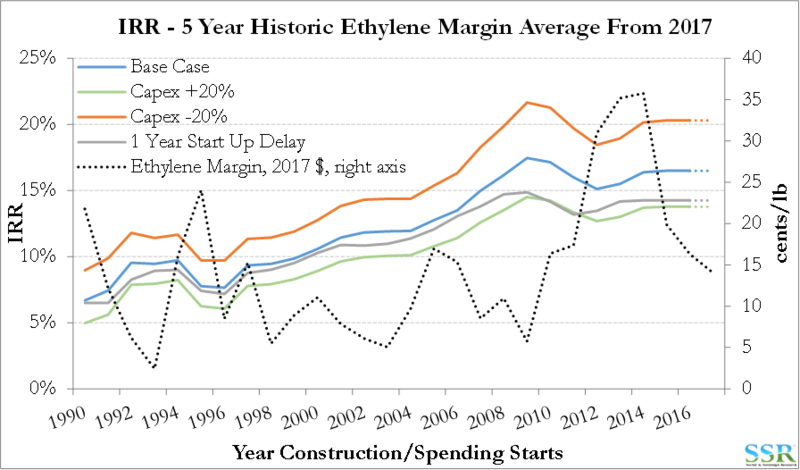 While we clearly have estimates in the analysis above, it is very hard to get an exact cost of ethylene construction in the US today, partly because none of the larger plants are complete yet and partly because companies are keeping numbers close to their chests and often talking about whole project costs, which include more than just ethylene. However, we estimate that the larger ethane based units are going to come in at around $1.10-1.20 per pound of capacity. To get a 12.5% IRR on a facility that takes three years to build you either need some very high margins in the early years of production or you need a fixed margin over the life of the plant of around 20 cents per pound. If you wanted a 20% contingency – to risk-adjust both the capital cost and the risk that you have a couple of early years of below trend margins, you would need to add a little less than 4 additional cents per pound to your required margin. If you assume that every pound of ethylene you make needs to be exported – you need a further cushion of as much as 5 cents per pound (for polyethylene) – Exhibit 9. Adding all of this up gets to a required margin of just over 28 cents per pound. If we assume the cost curve shown in Exhibit 4 we need an ethylene margin above the break-even economics of 15 cents per pound – Scenario A in Exhibit 10. Exhibit 10 requires some explanation. On the left, we build up the margin required to give a 12.5% IRR, we add a 20% contingency and we add the cost of shipping polyethylene to Europe/Asia – generating a total cost (above manufacturing cash cost) in excess of 28 cents per pound. 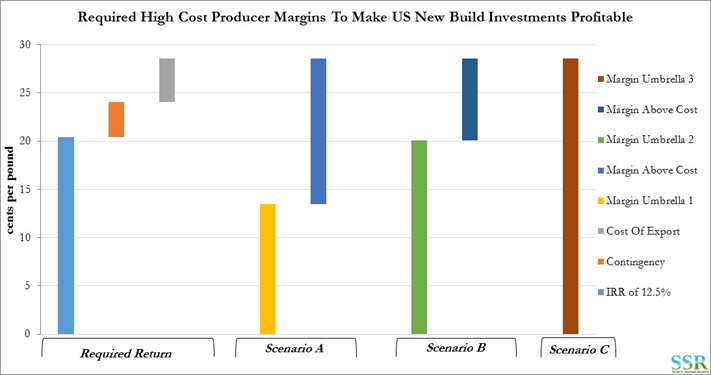 Scenario A shows the crude/natural gas umbrella based on the cost curve shown in Exhibit 4 and the required industry margin above break-even costs to make the required 28 cent margins. Scenario B shows recent history and likely current consensus – Brent at 55, Natural Gas at $3.00 and propylene and butadiene trading at 90% of ethylene pricing. Here we still need the break-even producer to make as much as 8 cents per pound of margin for the US investments to look good. Scenario C gives the US new build complete “air cover” i.e. the cost curve is steep enough to allow the marginal producer to produce at break-even – to get here we need Brent at $63, Natural Gas at $2.50 and we need propylene and butadiene to trade at a 25% discount to ethylene – this looks unlikely as both the natural gas and propylene/butadiene assumptions are too low. Note that in this analysis we are giving the US new build zero credit for site integration benefits, we are not borrowing margin from derivatives – i.e. no integrated margin assumption – and we are exporting every pound of ethylene as derivatives. Plotting ethylene margins against capacity additions globally – Exhibit 11 – we see a not atypical pattern for commodities – no real alignment with profits. Companies tend to build when they have the money – so all at once – driving over-capacity and margin declines in the early years of any required payback period. The chart shows global capacity additions and if we were to show just the US we would see capacity declining through most of the last decade. In a clear case of irony; looking at the chart in Exhibit 6, the ideal time to start a new project in the US would have been 2009. This was the year in which Flint Hills shutdown and began taking apart what was the closest ethylene plant in the US to the Permian Basin! At the other end of the scale – good luck versus bad luck – IPIC acquired Nova in 2009 – paying the same for Nova in total that Nova has just agreed to pay for 88.5% of the Geismar cracker. 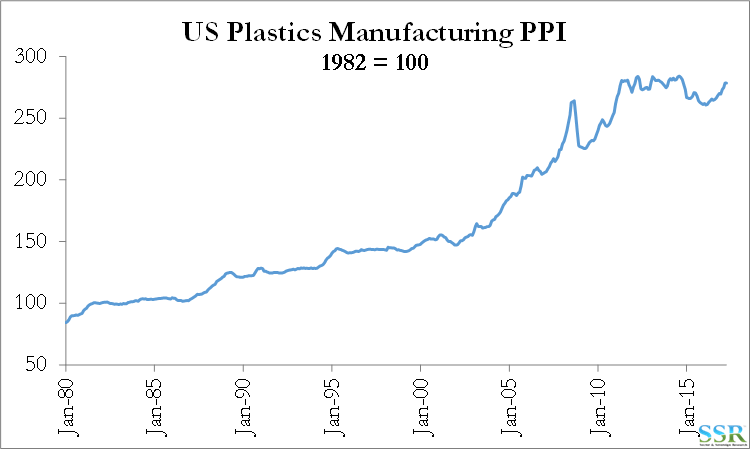 We have used the plastics manufacturing PPI below to reflate historic ethylene margins and promote a better comparison.